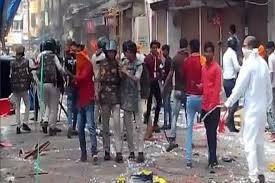 Shajapur: Violence broke out in Madhya Pradesh's Shajapur after stones were allegedly pelted on a procession to celebrate Maharana Pratap Jayanti, police said. According to eye-witnesses, the trouble started this afternoon when some people started hurling stones on the procession which was passing through the Nai Sadak area here. They also torched several vehicles and vandalised an electronic goods store. "Police resorted to lathicharge and lobbed tear gas shells to control the situation," the Sub Divisional Officer of Police, Kotwali, Padam Singh Baghel said. .After the violence, prohibitory orders were clamped in the town, he said. He added that a strict vigil was being maintained in the area.